I have so much to be thankful for. I often forget to say “thanks” – both to God and family and friends who love me. I need to accept their love and support. I need to say thank you more often. I want to be a better friend. That means listen more and not give advice unless asked. When someone tries to tell me how to fix it, I need to hear what God wants me to hear and to forget the rest. I am thankful for the computer to research this tumor. I am thankful for good eyes to read the articles and comments by others regarding various surgeons and radiologists. I am thankful this tumor is slow growing (if it is growing). This gives me time to research. I keep a journal called Trust in the Lord. 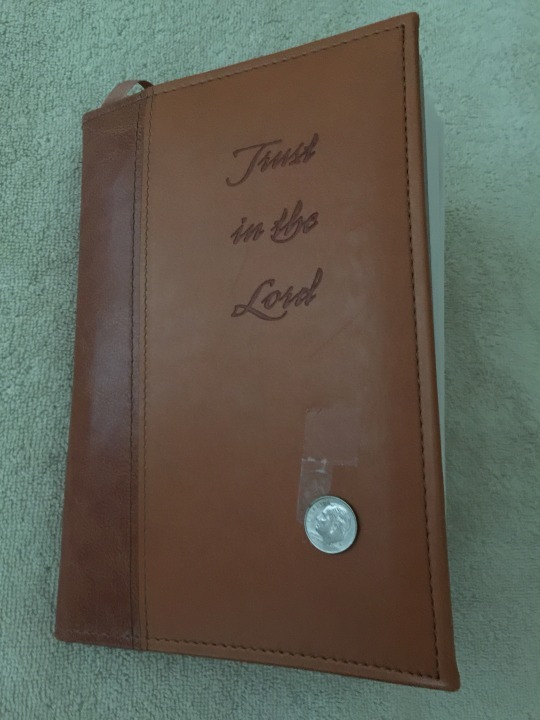 When I find a coin, “In God We Trust,” I place it in a plastic sleeve and attach the coin to a page. I date the page and summarize my current prayer requests and thanksgivings. Each coin reminds me to trust. If I find myself looking for a coin (I never find one when looking), and can’t see one, I touch the dime in my pocket to remind me – I don’t need to find a coin to trust in the Lord. I found a dime on the backseat of the car on the way to the funeral home after Dad died. I didn’t want to go and the dime was like Jesus said, “Trust me!” See the Devotions section for the devotion I wrote for the Gary Chapman compilation Love is a Verb Devotional. What reminds you to trust God? Forgive me when I forget to trust and thank you. When I read the story of the ten lepers in Luke chapter 17, I am reminded again – you want to hear us say thank you. Amen.